The structured black rubber strap of this Irony Chrono contrasts is bright orange. 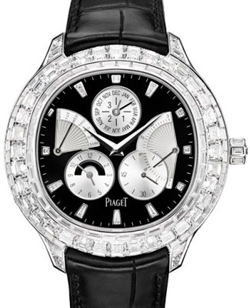 The case and unmarked bezel, which surrounds the black dial, are made of brushed stainless steel. On the white-on-black minute ring interrupt printed, white Arabic numerals, the orange and white hour markers. Silver launched Arabic numerals mark all hours with 12, 4 and 8 clock, and the frame of a broad, white-on-black date window at 12 clock is also placed in silver; the counter for 60 minutes, decimal, and small seconds are of silver appliques and have enclosed in orange or white numerals and indices and orange hands.